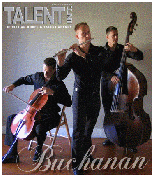 Buchanan & Co. consists of a group of three players, Buchanan Marais on Flute, Pan Flute, and Harmonica, Armandt Marais on Double Bass, And J.P. Malan on Cello. Buchanan Marais studied music at Wits University and has played with various symphony orchestras before going solo as a recording artist. He currently has four cd releases on the market, and is playlisted on several South African radio stations. Buchanan has appeared as guest artist on TV shows such as Paeslla and Kyknet, and has also been the producer of many recordings by top South African Artists, ranging from opera to contemporary pop and hard rock. Armandt Marais graduated from the Johannesburg School of the Arts and plays Double Bass at the very highest level. He is currently one of the best classical session players in the country, and also the principal bassist of the celebrated Salon Music project.J.P. Malan is one of the rising new stars in the music world. His virtuosic Cello playing has been noticed by visiting virtuosos, and he has subsequently traveled by invitation to Germany andHolland to attend masterclasses, and to perform. He is currently involved in playing competitions, and performing chamber music.Buchanan & Co. is a group that has a lifetime of experience in all types of performance situations. They use digital backtracks along with a discreet and aesthetically pleasing P.A. System, and in this manner can perform at small intimate functions right through to full conference halls. The genres of music they play range from Classical, Film themes, Jazz, Latin American, Pop, and World Music, and has been carefully researched and tested on the public to please all tastes. Buchanan is deeply committed to providing a groomed, stylish, and professional service to all clients.